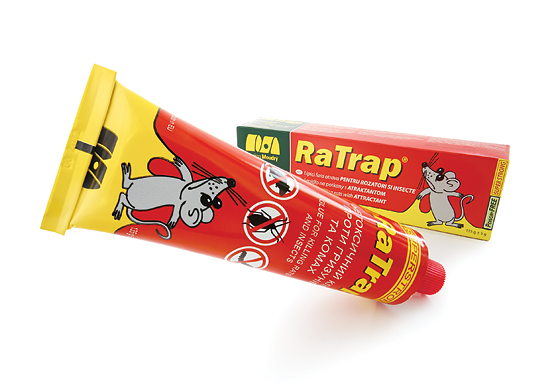 RaTrap – Glue trap for rodents | Papírna Moudrý, s.r.o. The glue is used for catching mice, rats and insects. While handling spread the glue on a non-absorbing flat material as carton, plastic foil, wooden board etc. It is necessary to make a flat layer of the glue sized 20x20 cm. Some suitable bait can be added onto the glue layer. The glue contains a food-based attractant luring mice, rats and cockroaches. The stickiness and adhesive power of the glue is optimally set so that it is able to catch mice, rats and insects well and still it is easy to squeeze out of the tube. Our glue has high resistance against the sunshine that usually causes a quick degradation of these kinds of glue. When the glue is exposed to the direct sunshine it keeps the adhesiveness for much longer time than other competitive glues.